Imagine you are a child waking up on Boxing Day in Gosforth – yesterday you received the most wonderful Christmas present, a beautiful, shiny new bicycle. In your head, you are Sir Bradley Wiggins setting the hour record or Lizzie Armistead winning the rainbow jersey. But there is one problem. 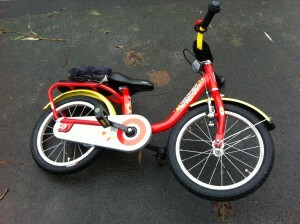 Where is there space in Gosforth for a child to ride? A generation ago it was a common sight to see children riding in the street – and many parents are still nostalgic about riding their Choppers or BMX bikes. Today, however, traffic and other safety concerns mean there are far fewer children using the streets, even though adult cycling numbers are increasing. This quote is from a paper looking at child cycling, which was published last year in the European Journal of Transport and Infrastructure Research. The author is Dr Rachel Aldred, senior lecturer in transport at Westminster University. Dr Aldred is also a trustee of the London Cycling Campaign and Chair of its Policy Forum. In this post, we will look at Dr Aldred’s research. If we want children to be able to cycle safely around Gosforth, whether to the park or to the shops, we need to understand what works. While the conclusions in this research will echo what cyclists and parents have been saying for years, Dr Aldred’s research is peer-reviewed, which means her methods and conclusions have been validated by her fellow academics. This is important as it means that her research is authoritative. a sensible 12 year old on his / her own. ‘most people’ (which included a wide range of abilities including less confident cyclists). 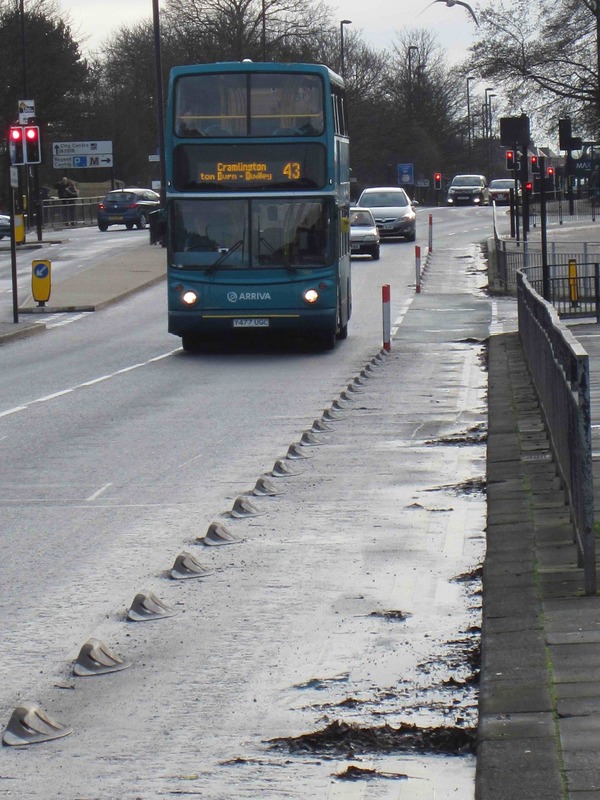 As yet we do not have this type of route in Gosforth, but a separated lane is being built in the City Centre on John Dobson Street (see picture). Although we can’t judge the route until it is completed, SPACE for Gosforth thinks that it looks highly promising and potentially suitable for Gosforth High Street. We like the clear separation from motor traffic, that the lane looks sufficiently wide for a faster cyclist to overtake a parent to riding alongside a child, and that the zebra crossing makes clear the need to let pedestrians cross. 2. 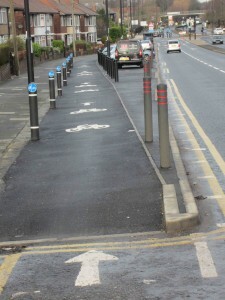 Cycle lanes on 20mph roads separated from the traffic by both armadillos (raised humps similar to the orcas on the Great North Road) AND a row of car parking. Part of the route on the Great North Road between the Regent Centre and Broadway is similar to this description, where the cycle route is separated from the traffic by parking and bollards (see picture). 3. Filtered Streets: 20mph roads with no through motor traffic. An example of this type of route is Alwinton Terrace cycle route (pictured), as the junction between Christon Road and Alwinton Terrace is closed to motor vehicles, but accessible for cyclists and pedestrians. South of Church Avenue, this route continues, but the Moor Road North section IS NOT an example of a filtered street, as traffic can use the street as a through route from Moorside to Church Road. There are other streets in Gosforth, as well as nearby in Kenton and Jesmond, that have already been filtered and it would be relatively inexpensive to open these up for cycling in the same way that the Christon Road / Alwinton Terrace one is. We think that filtered streets could benefit children, particularly older children or those carried on the back of parents’ bicycles or in trailers. 4. Park routes shared between between cyclists and pedestrians. We have a number of these routes in and around Gosforth, such as this route across the Little Moor (pictured). 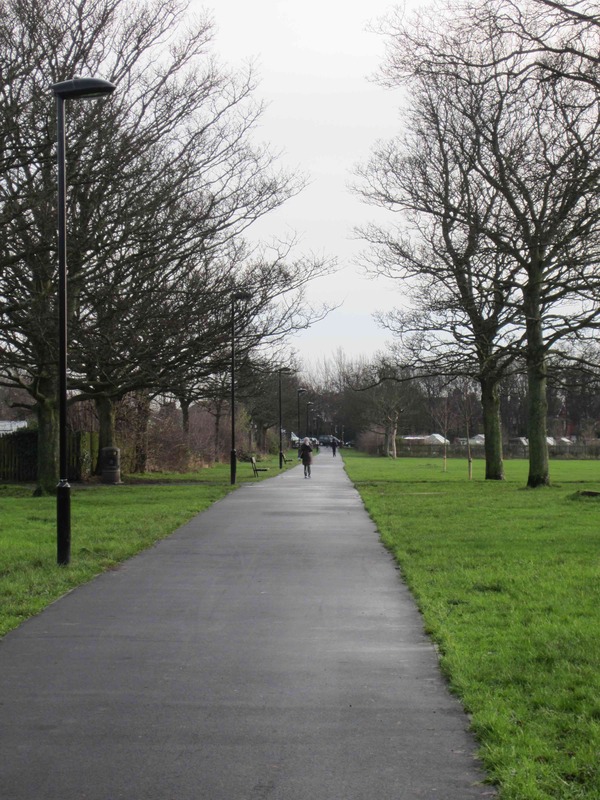 A smaller majority (ranging between 61% and 76% for each of the four scenarios) also thought that another type of route, number 5 below, might also be suitable for children and less confident cyclists. Another part of the Great North Road route (by Gosforth Academy) is similar to this description. The orca separated route is preferable to the lack of separation previously on that route, and preferable to the stretch immediately south at the Regent Centre which is only a painted lane (see point 8 below). We expect that this stretch will encourage more adults and older teenagers to cycle. However, we question whether this route is suitable for younger children, because the orcas provide only narrow separation from very fast moving traffic and because this route is too narrow for a parent to ride alongside a child. Gosforth High Street in its present state is a good example of this. 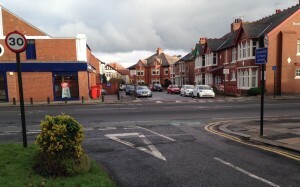 To make the High Street potentially suitable for a child to cycle, it would need a lane separated from the road and the pavement by a kerb (see (1) above). 7. Quiet residential roads that cross a reasonably busy main road. 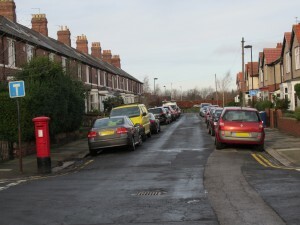 The crossing from The Poplars to Roseworth Avenue across the south end of Gosforth High Street is a local example of this, where these two residential streets are separated by a busy main road (Gosforth High Street). Alwinton Road and Moor Road North (which meet on Church Avenue) used to be a good example of this. 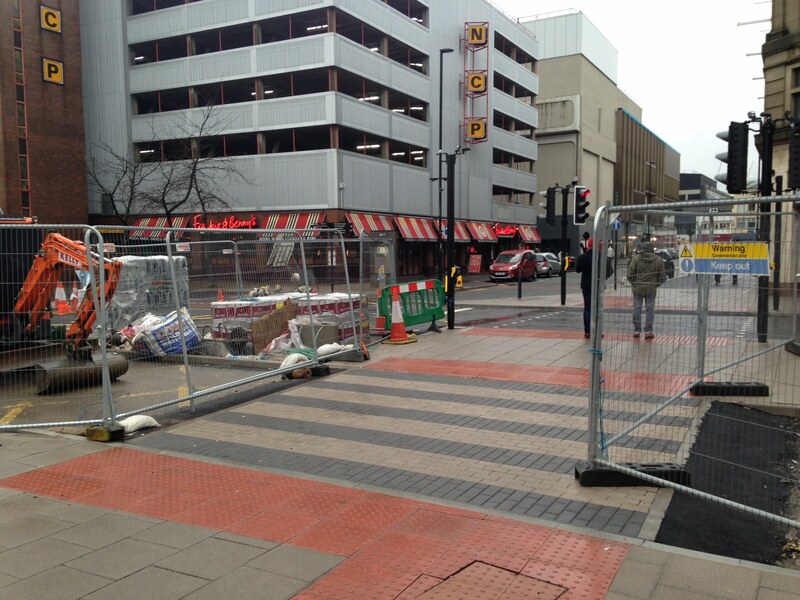 These streets have now been linked by traffic lights which make it possible to cross safely. 8. Mandatory painted cycle lanes. These are cycle lanes with an unbroken painted line signalling that motor traffic can not cross over into the cycle route. Broken lines, as we have on Gosforth High Street are not mandatory lanes, which means cars can legally enter these lanes. 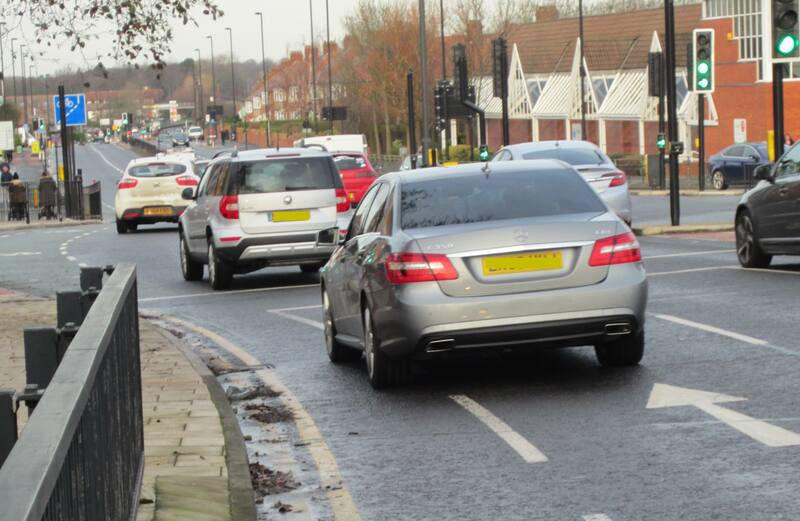 Unfortunately, as this picture shows from the Regent Centre cycle route shows, in Gosforth motor traffic frequently enters (and sometimes parks in) these lanes, and this makes this type of route unsuitable for children. 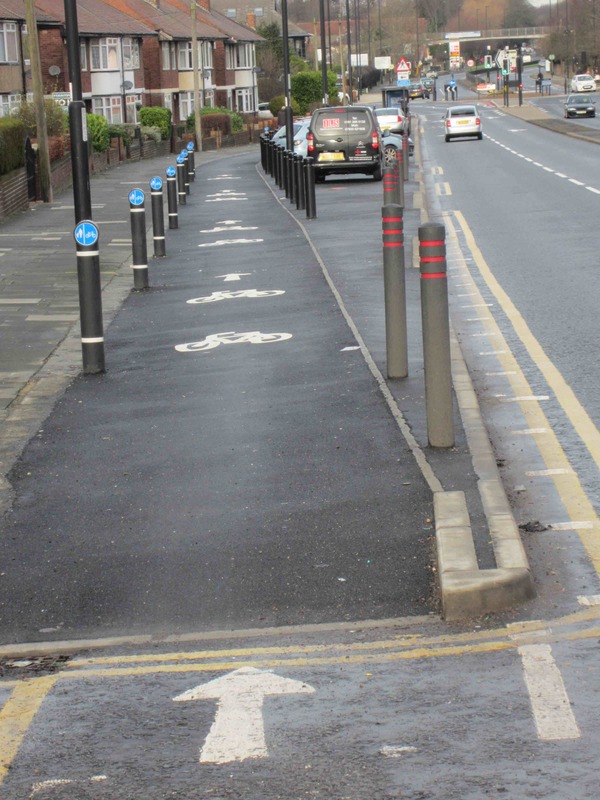 Again, to make these streets potentially suitable for a child to cycle, it would need a lane separated from the road and the pavement by a kerb (see (1) above). 9. Heavily parked residential rat runs. The term ‘rat run’ is controversial as many drivers argue that they are merely taking the most convenient route. However, it is undeniable that in peak hours in Gosforth, many otherwise quiet residential streets do experience much higher volumes of traffic than they can reasonably accommodate as drivers try to avoid our main routes. 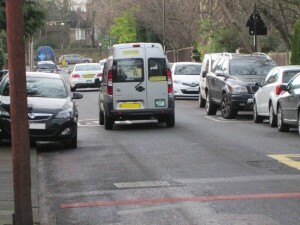 As well as making these roads unsuitable for children, the heavy traffic can also create excess noise for residents and make the street hostile for pedestrians. To make these street potentially safe for a child to cycle, the streets could be filtered as described in point (3) above. This would also reduce noise and make a safer and more pleasant environment for residents and pedestrians. 10. Shared bus and cycle lanes. 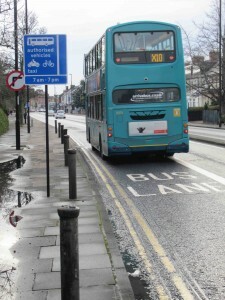 Gosforth has shared bus and cycle lanes on different stretches on the Great North Road that are also shared with taxis and motorcycles. The difference in speed and power between buses and cyclists is even greater than between cyclists and cars, and probably explains why respondents thought this route was unsuitable for children. For engineers, town planners and others involved in creating cycle infrastructure, listening to these voices is crucial. When asked about how they would like to travel to school, children repeatedly say that they want to travel by bike. But few do, and that isn’t surprising when even Olympic Gold medallist and yellow jersey wearer Chris Boardman says the roads are too dangerous for his child. Making Gosforth’s streets safe for children would have immense benefits for our community. For the children themselves it would increase independence and fitness. For the wider community there is the potential to move a large chunk of school run traffic from the car to bicycle, with benefits both for congestion and reducing air pollution. As this Dutch blog post and video show, when children are given the choice of how they can travel, many of them will choose to cycle. 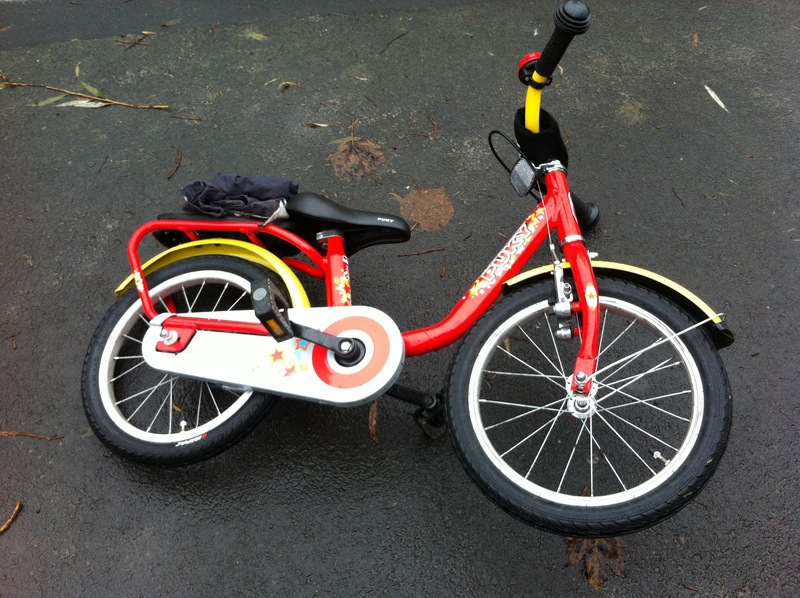 This entry was posted in Children, Cycling, Safety on January 19, 2016 by SPACE for Gosforth. I have a bike- upon which I ‘pootle’- mainly round the back fields/lanes/bridlepaths. I’d love to cycle more but- in Gosforth ? No. So I walk a lot to the ‘village’/High Street. Purpose built cycle lanes as in the Netherlands are the only way. Maybe filtered streets but they are usually parked up so the cyclists are in the middle of the road. Unless they are kerbed down the centre, shared park routes are dangerous for pedestrians as many cyclists come in groups- and don’t have /use bells. I would not want a child of mine to cycle in Gosforth as the streets/cycle lanes are too narrow and too heavily trafficked for it to be safe for them. I attended meetings for the changes that took place in Gosforth High St. One of the main points the council determined was that The street behind Central Park was for inexperienced cyclists and the High St itself given over to the more experienced cyclist. So there is provision for child/less confident cyclists in that particular area. Real shame to hear that someone from the council was daft enough to suggest that. The high street is by definition a linear destination, as important to kids as it is to anyone else. Addendum to A Pritchards comment. I agree I wouldn’t want my children to cycle down the High St, nor I might add, would I want to drive past one, I would be frightened of them ‘wavering’ and coming off their bikes.